Yeah, kinda, but you shouldn’t. First of all, using a DIRECTV splitter for an antenna is really a waste of money. Antenna splitters just don’t need to be built to the level of quality that DIRECTV splitters are. 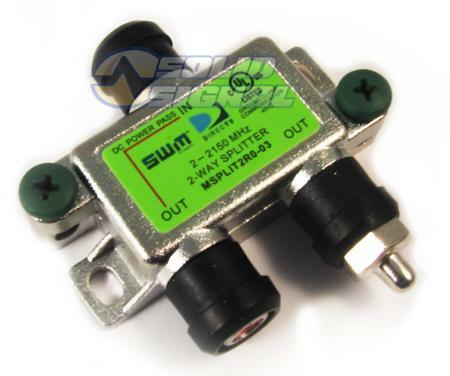 Not only that, DIRECTV splitters are specially designed to let frequencies pass from port to port. This could make no difference, but if any of your TVs is bouncing back interference due to a bad cable, it won’t stay isolated… it could affect every TV. But all that said, it works. I know, I’ve tried it in a pinch. If you have plenty of DIRECTV splitters sitting around and no antenna splitters, look all I can say is it works. I didn’t see any ill effects from it. I wouldn’t have set out to spend that amount of money on something like that but it didn’t seem to hurt anything. Signals were about 3dB lower than a straight run, which is on par with what I see with other splitters. So, if that’s what you need to do, I wouldn’t worry about it. You might take the time to get a cheaper splitter at some point and save that DIRECTV one for a rainy day, but it’s not going to be a problem if you don’t. Commercial Installers: How many lines are you running from the roof?